As a matter of fact a drop down grab rails does not comply with the accessible standard. Reason being that there is no standard for these products. Further more this statement serves to clarify this fact. 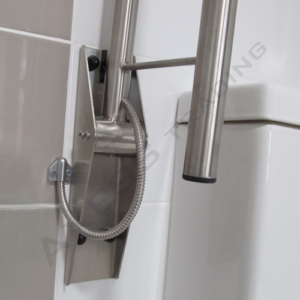 Builders, developers and architects specify a drop down grab rails as fitment to the walls behind toilets .When lowered to a horizontal position adjacent to the toilet the user has a secure support. Best practise is to install rails one on either side of the toilet. Drop down rails disabled need strong wall support in the form of additional in wall blocking built into the walls. Builders consult their architects and design engineers for the appropriate in wall structure and fasteners . 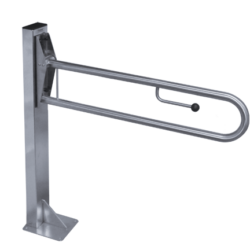 Drop down grab rails disabled can be seen in many advertisements , the use of these products remains an area of uncertainty. One of the main uses for these handy products is where carers help patients transition from wheelchairs onto toilets. Accordingly, where ambulant people receive help with getting on and off a toilet. 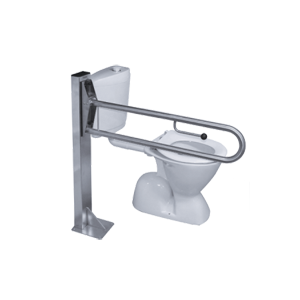 Sometimes drop down rails help children with autism where the rail is mounted in a transverse position in front of the toilet so as to provide a gate. Autistic children hold on to these preventing falls. Drop down rails with nurse call provision. In busy hospitals high care centers and and residential retirement builders and developers deploy bathroom safety products with nursecall provision. Wiring points for hardwired nursecall equipment provide the conection point for drop down grab rails with nursecall provision. Before deciding on the use of comunication equipment, careful planning is needed for wiring and conection points. Our products include only the hardware provision and therefore all communication equipment is suplied by others. We supply a set of coach screws with every drop down rail, however substrates do vary from project to project .When fitting drop down toilet rails into pre built toilets and washrooms, a floor-mounted post works best to absorb and carry the load exerted on the rail. 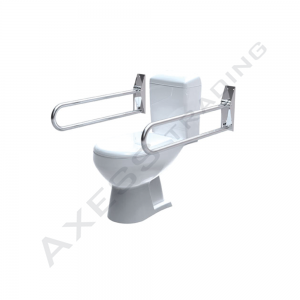 At Axess Trading we offer a variety of drop down toilet rails. The floor post manufactured from 304 grade stainless steel fully welded for long service and durability. The floor post is ready to receive the type T40 and T45 rails by means of 4 set screws with screw caps, no drilling required or further on site work required. 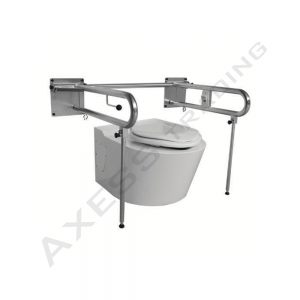 In addition the post ensures that the height of the drop down toilet rail is 800mm measured from the floor with the rail in a horizontal position. Therefore even more time saving is achieved by only having to position the post in the corect position adjascent to the toilet or where needed.